April 2007 Podcast is Here! I’ve posted our latest podcast from Storyteller.net and Seantells.com. The link is below or you can find it on Itunes. You can also find it on my Myspace page. We did something a little different with this podcast. I recently spent a day as guest artist in a 7th grade classroom. That’s with young people about 12 and 13 years old. I recorded large portions of the day. I’ve narrowed those recordings down to a 35 minute podcast. There are four stories in there and a coaching moment. Even the coaching moment comes from the day with the kids. You’ll hear this again on the podcast, but I wanted to talk a bit about this here. As you know, those of you who have taken my storytelling training or coaching, that although you as a teller and your stories may remain consistent, when you change your audience you change your style. So for this group, I was speaking specifically to a small group (25 or so kids) in a small room. It was a close and intimate environment as oppsed to a big stage or an entire school assembly. The kids had also just finished a week of Arizona's mandatory testing, so they, and the teachers in the school, were pretty exhausted. We like to describe these mandatory tests as "no child left untested." We had a casual, informal day together. The risk anyone takes when they put forth recordings of themselves is that the listeners will think, “Oh, that is the way they always tell.” That’s simply not true of any storyteller anywhere. Well, at least the ones who understand their craft. As you listen to this piece, keep the above paragraph in mind. Like all tellers, I have a variety of styles to choose from (and have chosen from) when my audience is 2 or 2000, aged 12 or 72, big stage or small classroom. And, before you write me (ha ha!) about the Hades and Demeter comment, please know that I know it’s Persephone that brings the Spring, not her mother. Our podcasts are sponsored by StorytellingProducts.com. Please stop by and support our work by purchasing a CD or Book from there. Thanks. I hope you enjoy this month’s podcast. Click here to get it now. Happy Birthday to us at Storyteller.net. This month, April 2007, Storyteller.net turns 10 years old! Ten years is forever in Internet terms. Excuse me for a moment as I enjoy this. It is rare to read a note from me that is so "yay for us" in nature, but I think we deserve it this time around. I am proud of what we have done and what we have achieved. Others have said, and I agree, that Storyteller.net has helped storytelling move forward not only on the Internet but in the world community as well. 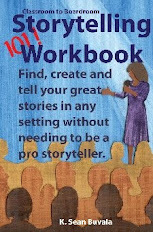 I had already been working nationally as a storyteller for 10 years when we created Storyteller.net. As a pro, I knew what needed to happen on the Internet for storytellers and was fortunate to be able to create that. Storyteller.net has never been "Sean's site." Rather, it's been "our site," tellers both near and far, since the beginning. Our remake in 2002 just made a good thing better. Storyteller.net has been a labor of love for many years, a gift to tellers and our guests. We were the first to offer a comprehensive online directory for storytellers initially at no cost and now just $25 per year. More than 400 tellers have used or are using our services and we're glad to have given you a home. We've watched tellers transition and grow from simple, beginning local tellers to some of the best nationally-travelled tellers in the business. What a joy that has been. We were the first to offer a diverse collection of online audio stories, free for listening for audiences all over the world. There's also a growing collection of written stories on our site. We were the first with an online, no-charge events calendar. We've had two editions of the Storyteller.net store, with our current store at StorytellingProducts.com going strong. Again, if memory serves me correctly, we were the first to offer the ability for national online sales to the local tellers of the world. There's some imitators coming along, but we were the first to "level the playing field" for storytellers everywhere. We were the first to offer the pod-cast like Amphitheater with storytelling interviews and performances. Yep, we were doing "podcasts" before they even had a word to describe "podcasts." I remember my business partner telling me that I was "crazy" to do those Amphitheaters and then several days later saying he thought the idea would prove to be brilliant. Little did we know that what we were doing was very far ahead of the Internet pack. In ten years, we've had a variety of other firsts. I always enjoy reading when another storytelling organization or individual promotes their idea as "the first ever..." when we've been doing it since 1997. Lots of people imitate our model. We're pleased to be able to have offered so much, usually at no or very little cost, to so many people. Thousands of people each week come and take advantage of everything we have at Storyteller.net. We're glad you are here. Watch for more changes in this our 10th Anniversary year. Over the coming weeks and months, we'll be sharing with you reviews and comments from our guests and members. We'll also be introducing new features to help you learn more about the Art of Storytelling. We have a live event (they call it "brick and mortar" in 'Net lingo) in the works that I think will be one more risk-taking, cutting-edge offering from Storyteller.net, one we hope will help change the way we all think about the nature of storytelling and who the "best" in storytelling are or will be. Whew! I am nervous just typing that one out! I think you'll be pleased, tickled and challenged by what's over the bend for the next ten years. Thanks for indulging me in this birthday letter.